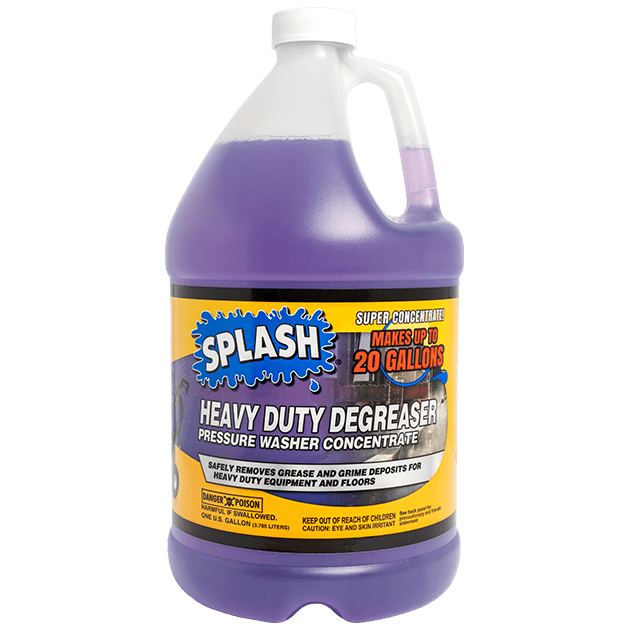 WHERE DO I FIND THE SDS FOR SPLASH PRODUCTS? 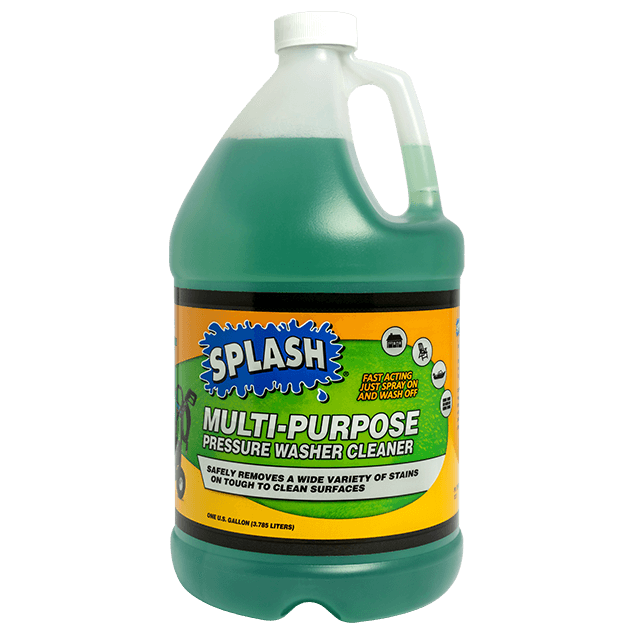 HOW DO I DISPOSE OF SPLASH PRODUCTS? 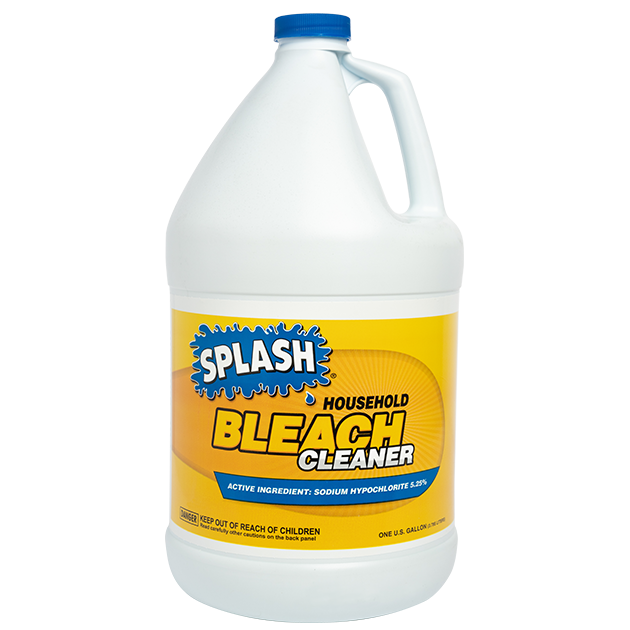 Follow your local municipality’s regulations to dispose of SPLASH® products. 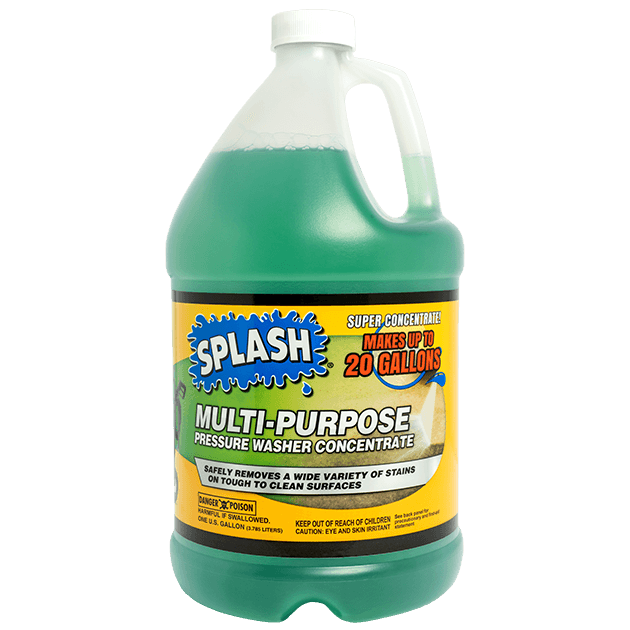 WHERE CAN I BUY SPLASH PRODUCTS? View our list of retailers. WHO DO I CONTACT IF THERE IS AN ISSUE WITH A PRODUCT? Contact us through our website or call 888-784-0802. WHY CAN WINDSHIELD WASH WITH FREEZE PROTECTION FREEZE WHEN IT IS +10°F OUTSIDE? It takes as little as 10 ounces or fewer of another windshield fluid product without freeze protection in the reservoir to raise the freeze point. When adding new product between seasons, we suggest you empty your reservoir completely to avoid dilution of your washer fluid so you have freeze protection in the colder months. IS IT BAD FOR YOUR VEHICLE TO RUN OUT OF WASHER FLUID? No. But it’s best to keep your reservoir from running dry. You never know when you’ll need fluid to wash your windshield. 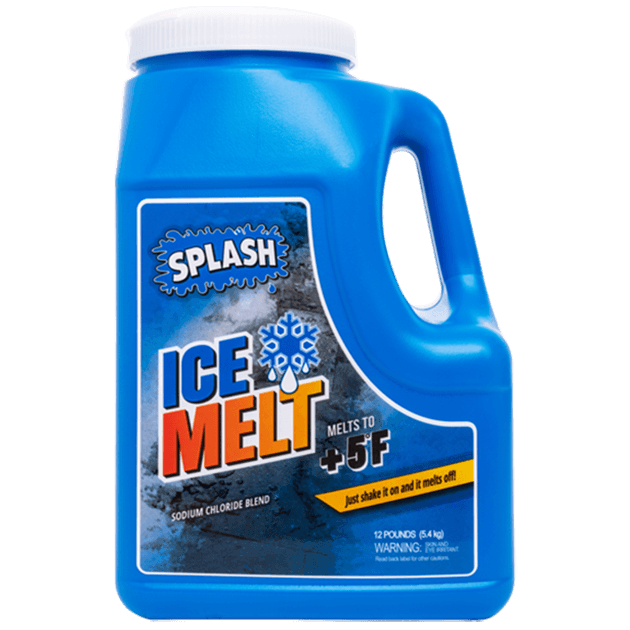 HOW DO YOU UN-FREEZE FROZEN WASHER FLUID INSIDE YOUR CAR'S LINES? Park your car in a warm garage for the fluid to thaw and consult your vehicle manufacturer’s recommendations. 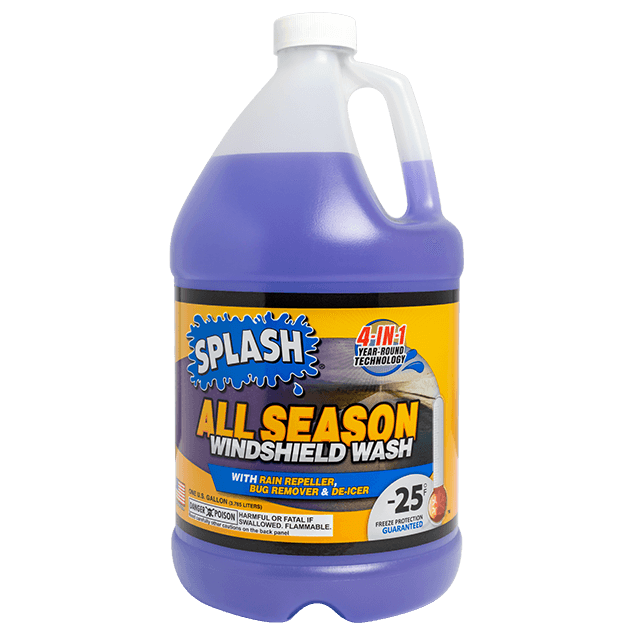 Then replace with a lower burst protection, like our De-Icer Windshield Wash that protects to -30°F. WILL -25°F ALL SEASON WASHER FLUID HELP WITH BUGS? Yes. 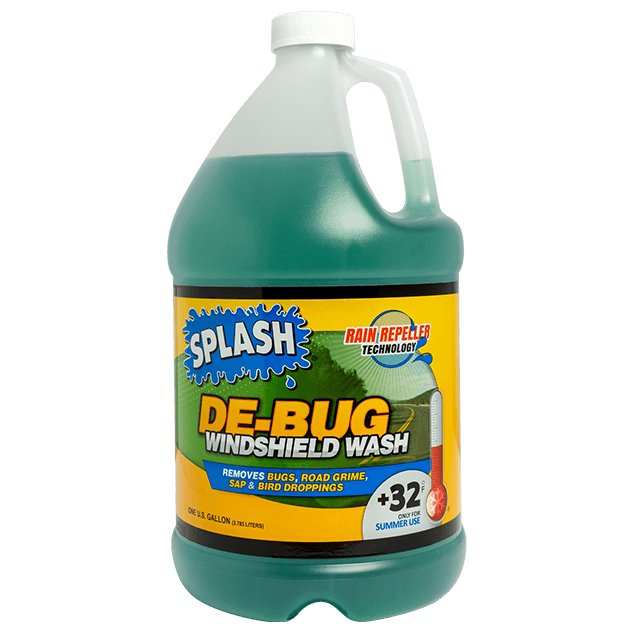 Our All Season 4-in-1 is formulated to dissolve bug grime, bird droppings, and tree sap. CAN WINDSHIELD WASHER FLUID CATCH FIRE IF SPILLED ON A HOT ENGINE? It’s unlikely. View our Safety Data Sheets for flash points and other warnings about specific products. HOW DO YOU UN-FREEZE FROZEN WASHER FLUID? If frozen in the bottle, place the bottle somewhere warm, above 32°F. IS WINDSHIELD WASHER FLUID DANGEROUS IF ACCIDENTALLY INHALED? 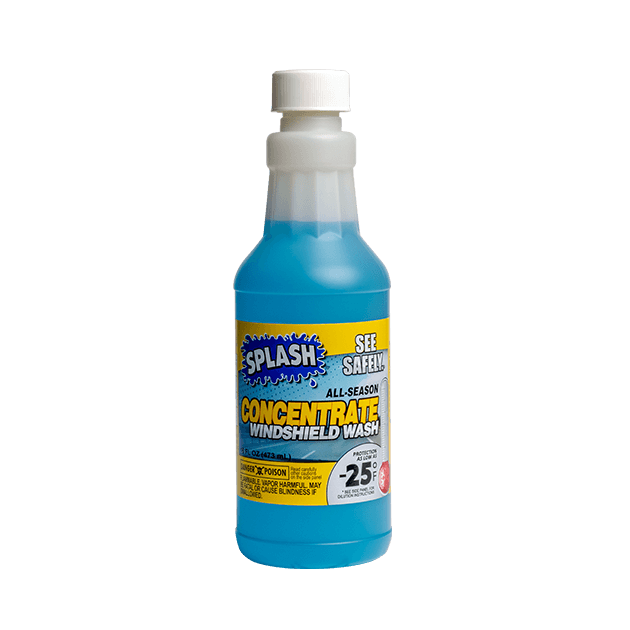 Inhalation during the normal course of refilling is not harmful, however excessive inhaling of windshield washer fluid vapor can be harmful. Call a physician immediately in severe cases or if recovery is not rapid. View our Safety Data Sheets for more warnings about specific products. DOES WINDSHIELD WASHER FLUID HAVE A SHELF LIFE? If unopened, windshield washer fluid does not have a shelf life. If opened, the shelf life depends on the storage environment. I ACCIDENTALLY ADDED RV & MARINE ANTIFREEZE TO MY WASHER FLUID RESERVOIR. WHAT SHOULD I DO? 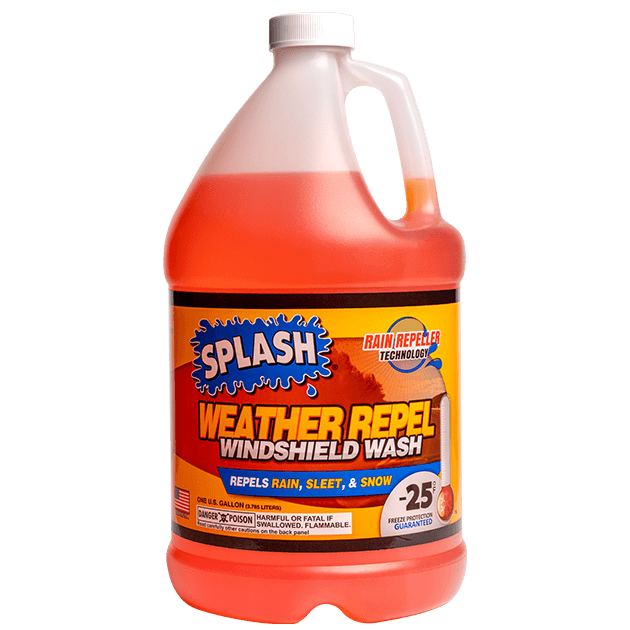 Remove the SPLASH® RV & Marine Antifreeze immediately and replace it with SPLASH® Windshield Wash Fluid. 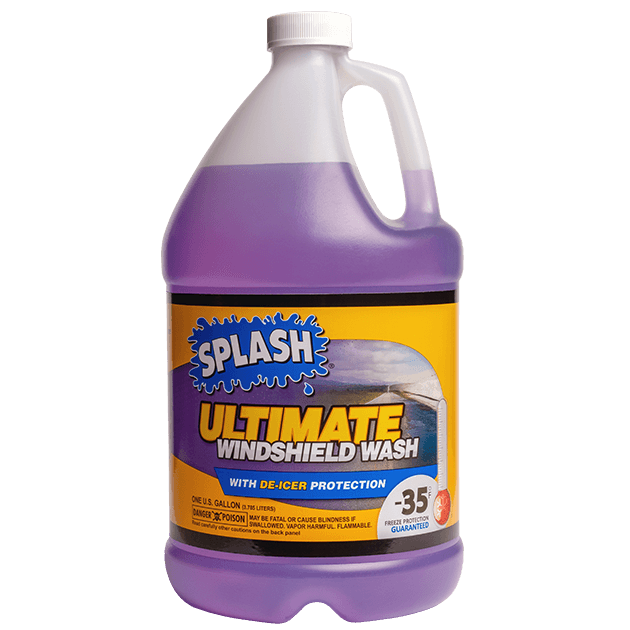 The RV & Marine Antifreeze will become opaque on your windshield to a point that you will not see. Consult your vehicle manufacturer’s recommendations for how to drain the washer fluid reservoir. CAN I USE A DIFFERENT SPLASH ON TAP HOSE THAN WHAT WAS PROVIDED OR ADD TUBES TO THE HOSE SO THAT IT IS LONGER? No. You cannot modify the hose provided. IF I WANT A DIFFERENT TEMPERATURE SETTING THAN THE FOUR PROVIDED, CAN I MAKE THE HOLE IN THE SPLASH ON TAP COLORED TIPS BIGGER OR SMALLER? No. The various temperature setting colored tips were tested in our lab to provide windshield wash at the freezing points outlined. Modification to any of the tips could result in large changes in the freeze points. WHY DOES THE WINDSHIELD WASHER FLUID FLOW SLOWLY WHEN THE SPLASH ON TAP HOSE IS HELD HIGHER UP? The container that you’re filling with the washer fluid from the pump hose should be lower than dispenser itself. DOES THE WATER PRESSURE FROM THE SPLASH ON TAP HOSE IMPACT THE MIXTURE OF THE WINDSHIELD WASHER FLUID? The water pressure will not impact the freeze point of the windshield washer fluid, but increased water pressure will fill your container faster. 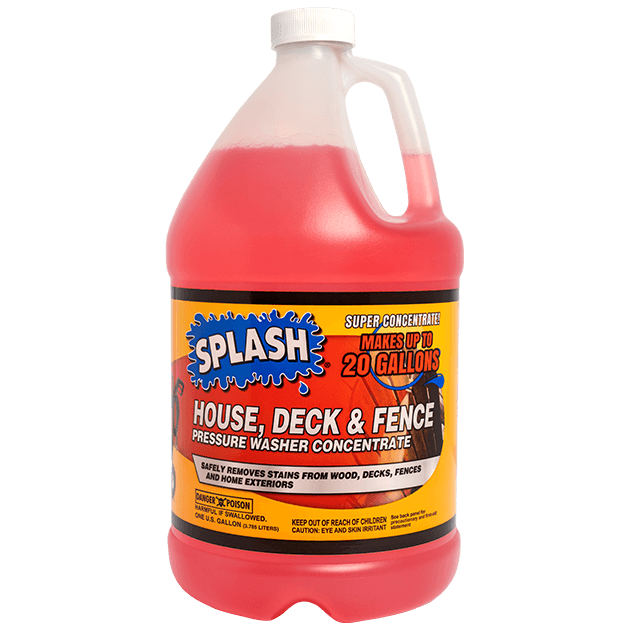 WHAT IS THE RATIO TO MIX FOR HOUSE & DECK WASH? We recommend one part concentrate to five parts of water. CAN YOU USE PRESSURE WASHER CLEANERS OUTSIDE OF A PRESSURE WASHER? Yes, although we recommend following product directions for best results. 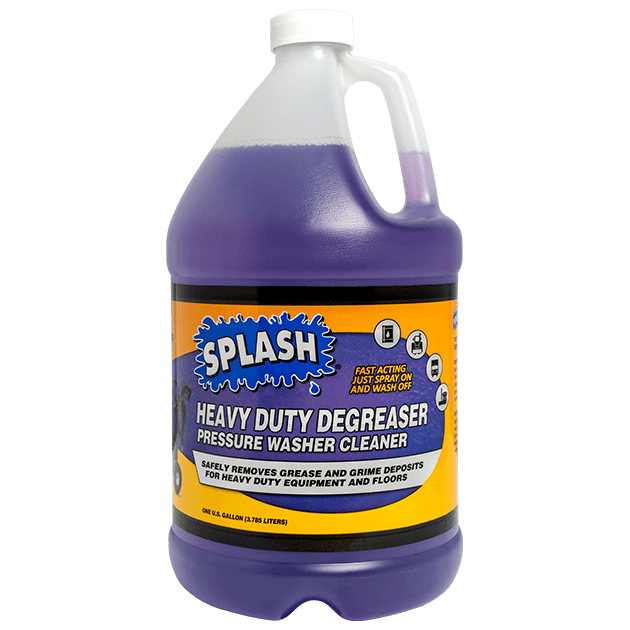 If you don’t have a pressure washer, our cleaning solutions will help you clean and remove grease from a variety of surfaces, just like any other heavy duty soap. Make sure to dilute with water and wear protective gloves, clothing, eye and face protection, as our formulas are highly concentrated. 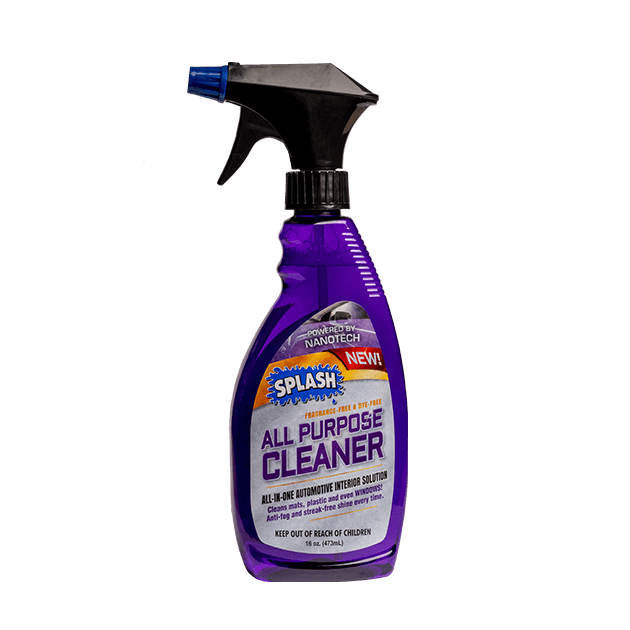 CAN I USE CAR WASH IN A PRESSURE WASHER CLEANER? Yes, although we recommend using SPLASH® Vehicle, Boat & ATV Pressure Washer Cleaner. WHAT IF MY PET DRANK SOME OF THE ANTIFREEZE? 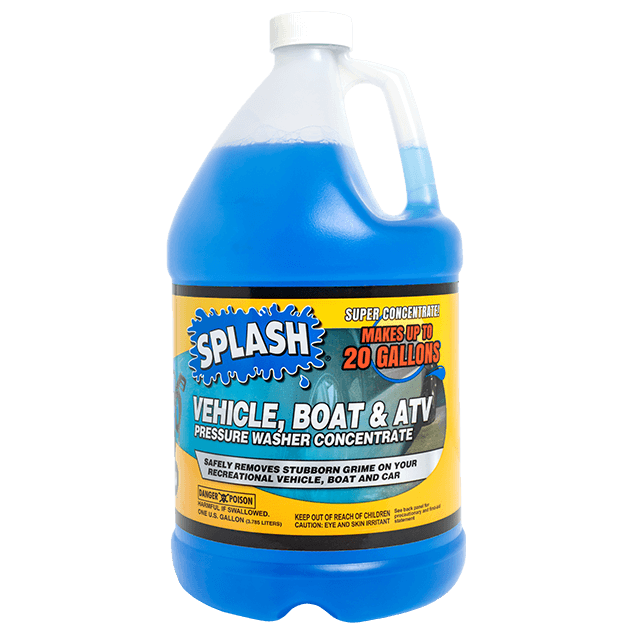 For dogs, SPLASH® RV & Marine Antifreeze is non-poisonous; consult your veterinarian for more information. If your cat ingested RV & Marine antifreeze, we recommend seeking emergency medical attention. CAN PROPYLENE GLYCOL REFRACTOMETER OR HYDROMETER BE USED TO MEASURE THE FREEZE POINT? No. SPLASH® uses a blend of different burst protection agents instead of just propylene glycol and water, so a refractometer or hydrometer will not measure the freeze point correctly. 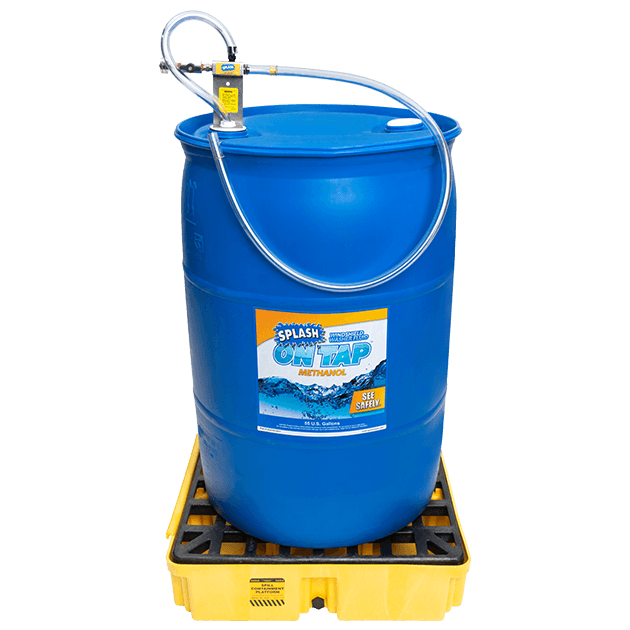 HOW MUCH POOL & SPA ANTIFREEZE SHOULD BE USED TO WINTERIZE MY POOL OR SPA? Follow the manufacturer's recommendations when winterizing all pools and spas. IS ANTIFREEZE DANGEROUS IF ACCIDENTALLY INHALED? We do not recommend inhaling antifreeze that contains ethanol. See label contents to determine ethanol content. If more than an incidental amount was ingested or inhaled during the regular course of use, seek medical attention immediately or contact Poison Control. View our Safety Data Sheets for more warnings about specific products. 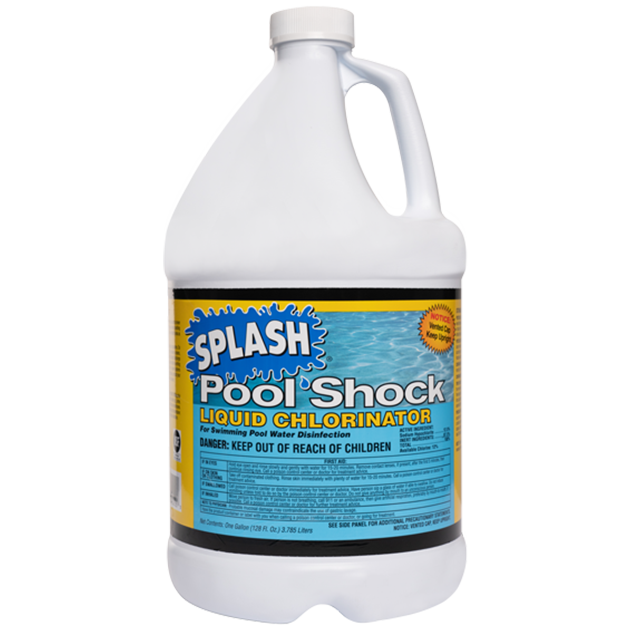 YOUR LABEL SAYS TO “REMOVE ANTIFREEZE WITH A WET VAC FROM ALL LINES AND EQUIPMENT IN THE SPRING.” IS THE ANTIFREEZE SAFE TO DISCHARGE TO THE POOL IF I CAN'T VACUUM IT OUT? Yes, the antifreeze is safe for incidental contact and will not be harmful if it is discharged into a pool. CAN I USE RV & MARINE ANTIFREEZE IN MY WOOD STOVE? No, it is not for use in a wood stove. Ethanol-based antifreeze and propylene glycol is dangerous in applications that involve heating. 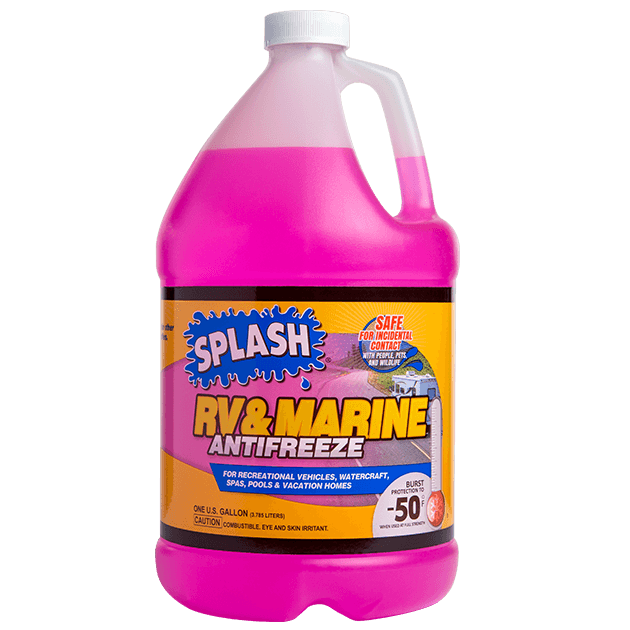 CAN I USE RV & MARINE ANTIFREEZE IN MY SEPTIC TANK? SPLASH® Premium RV & Marine Antifreeze is recommended for septic tanks. CAN I USE RV & MARINE ANTIFREEZE IN MY HYDRONIC HEATING SYSTEM? No. 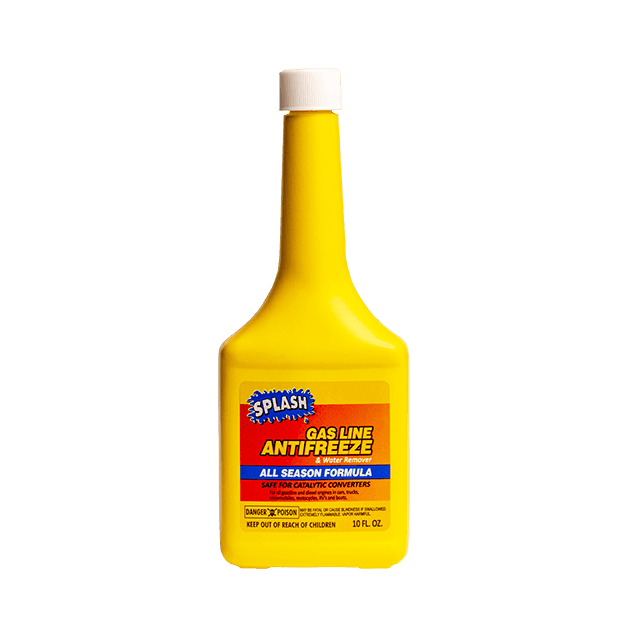 Our antifreeze products are intended for winterizing, not to be used as a coolant or to transfer heat. Antifreeze will turn acidic and may corrode metal parts over time if used in a manner that involves heat. Ethanol-based antifreeze is dangerous in applications that involve heating. We recommend using Heat Transfer Fluid 100% PG for this application. 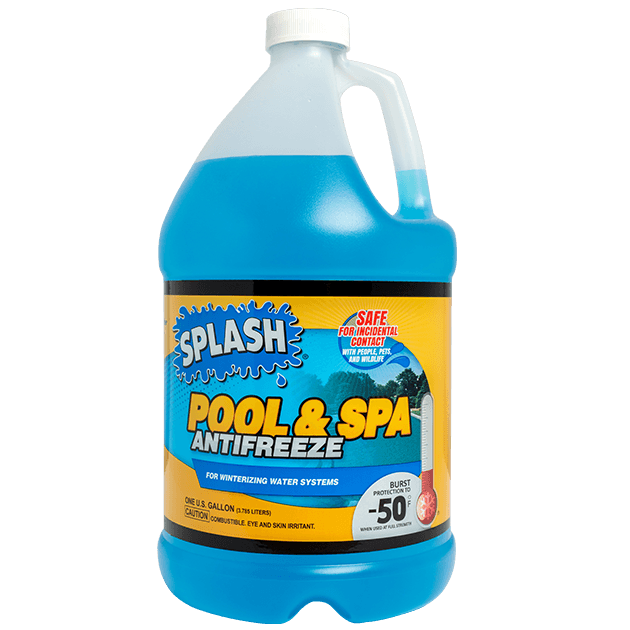 WHERE SHOULD I USE POOL & SPA ANTIFREEZE? 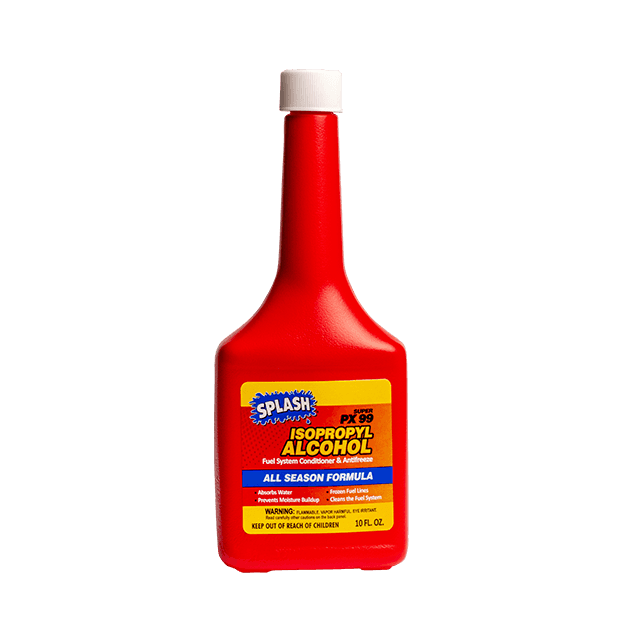 Consult your manufacturer’s recommendations for how to use SPLASH® Pool & Spa Antifreeze. CAN I USE RV & MARINE ANTIFREEZE IN TIRES? Yes, but we do not recommend using ethanol-based antifreeze in tires. Consult your manufacturer’s recommendations. CAN RV & MARINE ANTIFREEZE GO IN AN ENGINE BLOCK? No. Consult your manufacturer’s recommendations. CAN RV & MARINE ANTIFREEZE GO IN AN INBOARD MOTOR? CAN PREMIUM -50 RV & MARINE ANTIFREEZE GO IN THE COOLING JACKET OF AN OUTBOARD MOTOR? Yes. Consult your manufacturer’s recommendations. CAN I USE ANTIFREEZE IN MY HVAC SYSTEM? 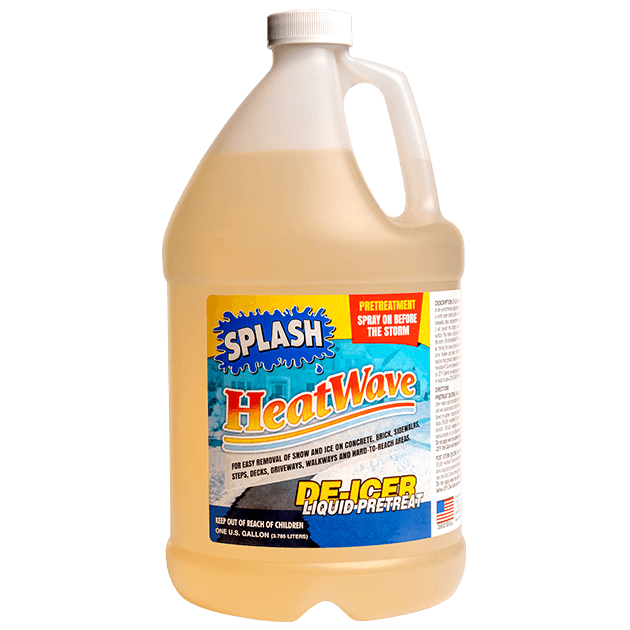 CAN HEATWAVE LIQUID DE-ICER BE USED WITH ICE MELT PRODUCTS? Yes. Use HeatWave Liquid De-Icer before a snowfall to prevent ice buildup and make shoveling or plowing easier. 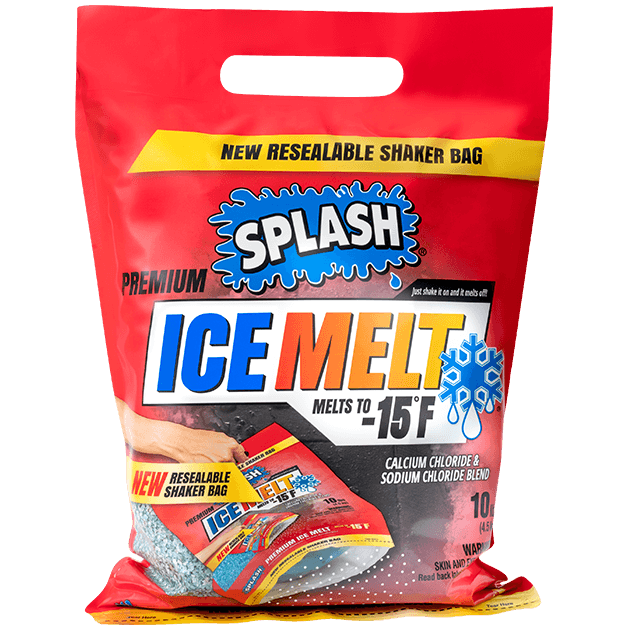 Apply our Ice Melt products following a winter weather event to keep your walkways and driveways clear, long after the snowstorm. IS HEATWAVE LIQUID DE-ICER HARMFUL IF ANIMALS WALK THROUGH IT? Heatwave Liquid De-Icer is not harmful when in contact with skin; however, it will cause eye irritation. Consult our Safety Data Sheets for more information. We recommend contacting your veterinarian or seeking emergency medical attention if HeatWave Liquid De-Icer comes in contact with your pets’ eyes. 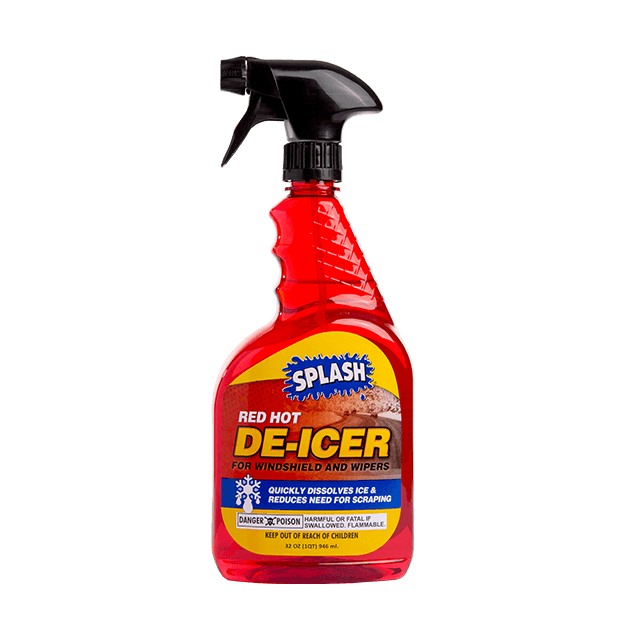 CAN RED HOT DE-ICER BE USED TO PREVENT ICE/FROST FROM FORMING? No. Red Hot De-Icer is intended to remove ice, frost, and slush that has already formed and should be used with defrosters. Use our HeatWave Liquid De-Icer to prevent ice/frost before a snowstorm. WHAT MAKES PET SAFE ICE MELT SAFE FOR ANIMALS? 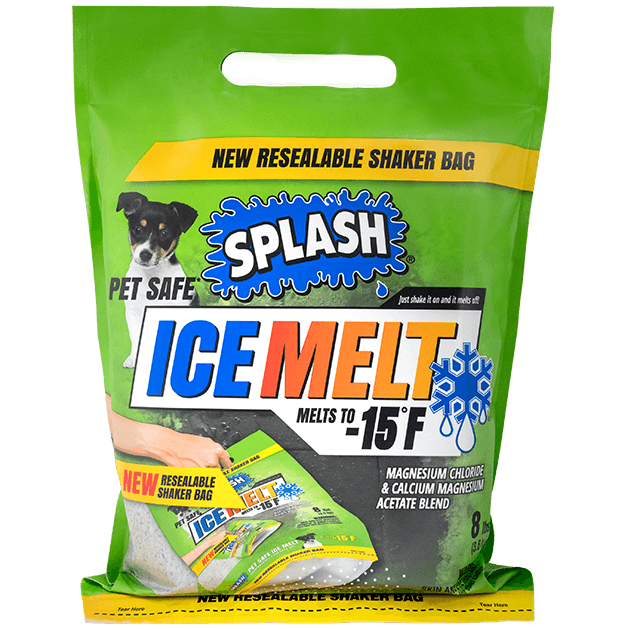 Pet Safe Ice Melt is made with magnesium chloride and calcium magnesium acetate, which are safer for pets than sodium chloride, the ingredient most often used in ice melts. This type of salt does not have any hazards for skin contact. Consult our Safety Data Sheets for more information. 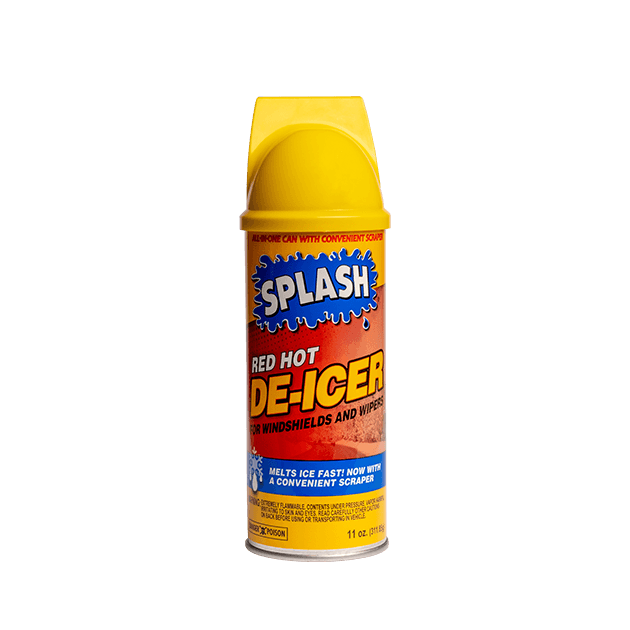 IS RED HOT DE-ICERS DANGEROUS IF ACCIDENTALLY INHALED? It is not dangerous during the regular course of use, though we do not recommend inhaling Red Hot De-Icer. Consult our Safety Data Sheets for more information. If ingested or inhaled, seek medical attention immediately or contact Poison Control. WILL ICE MELT DAMAGE MY SIDEWALKS AND DRIVEWAY? Salt, along with the freeze and thaw cycle, can damage concrete. To minimize surface damage, use only enough Ice Melt to loosen snow or ice, and then promptly remove slush and ice from concrete surfaces. 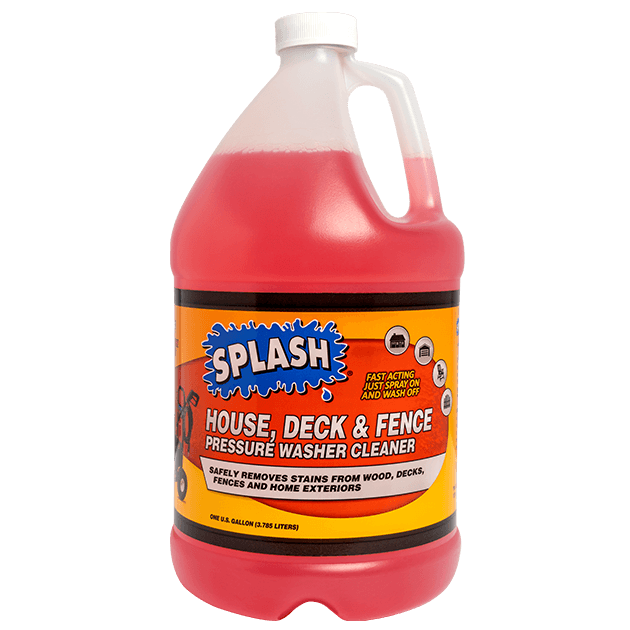 This product is to be used at the consumer’s risk of loss from damage to surfaces. WILL PREMIUM ICE MELT HARM MY SKIN? Short-term, singular exposure is not likely to cause significant skin irritation. Prolonged or repeated exposure may cause skin irritation or even a chemical burn. 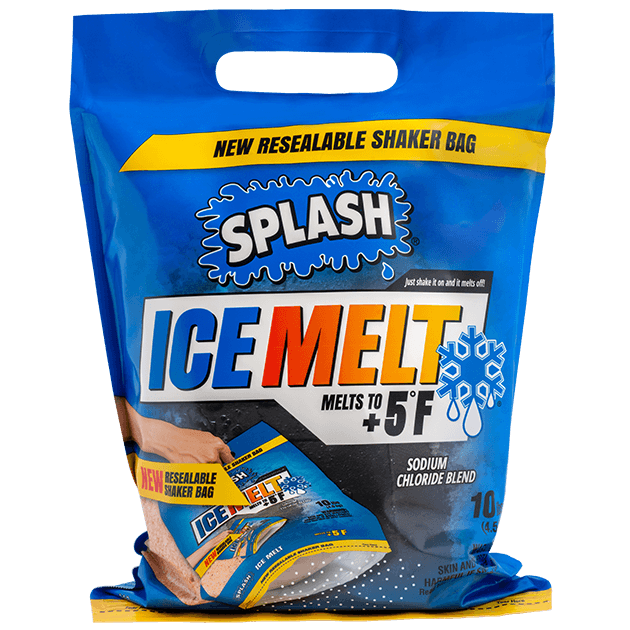 Premium Ice Melt may cause a more severe response if confined to skin or in contact with abraded (scratched or cut) skin. Consult our Safety Data Sheets for more information. WILL ICE MELT HARM MY GRASS OR PLANTS? Yes. 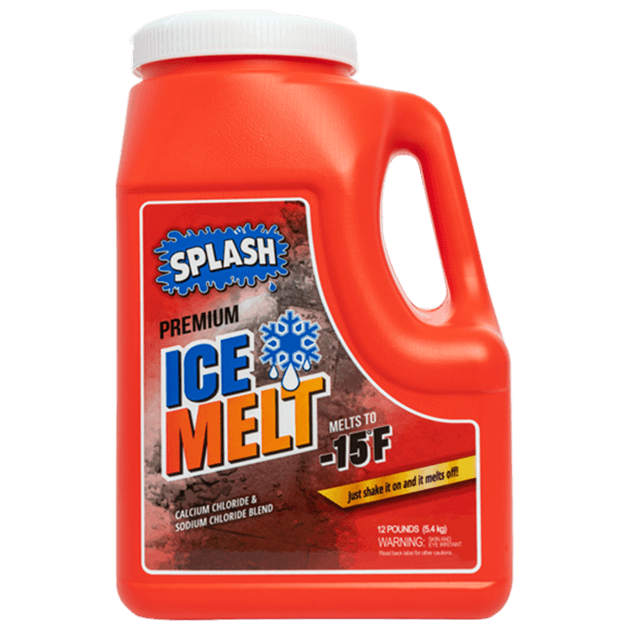 SPLASH® Ice Melt contains salt, which will damage vegetation. 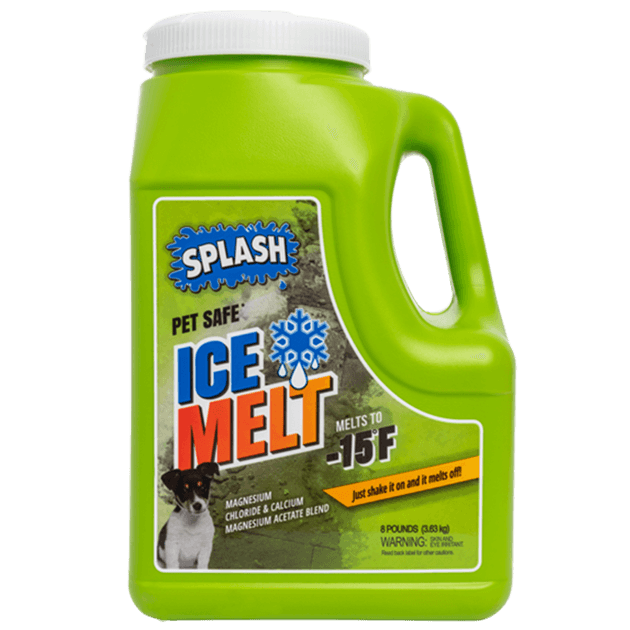 We recommend using our Premium Ice Melt or our salt-free formula, Pet Safe Ice Melt, to prevent harm to grass or plants. IS GLASS CLEANER SAFE TO USE ON ELECTRONIC SCREENS IN MY CAR? Yes. 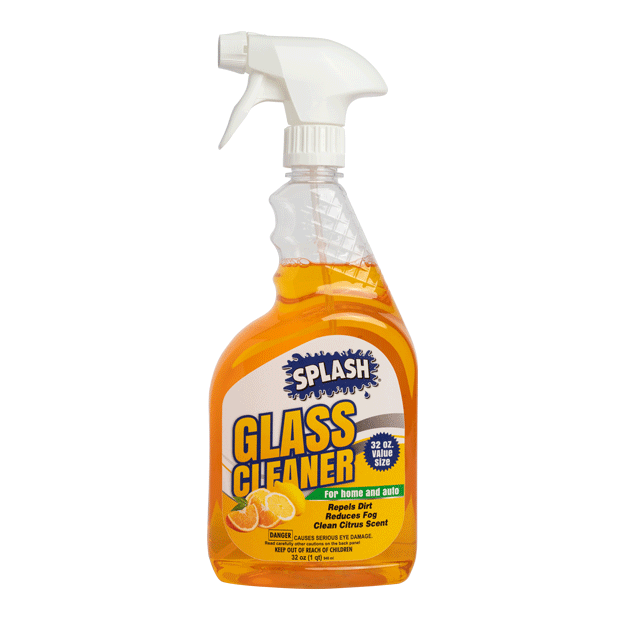 SPLASH® Glass Cleaner is safe for any glass or monitor/display surfaces. WHAT ARE THE SIGNS THAT YOU NEED TO CHANGE YOUR WIPER BLADES? Wiper blades should be replaced every six months to a year, as soon as you notice a difference in driving visibility. When they no longer make proper contact with the windshield surface and begin to squeak, chatter, skip, smear, or streak, you should consider replacing them. Check out our full line of wiper blades. HOW DO I KNOW WHAT SIZE WIPER BLADES I NEED? Use our wiper blade lookup. Yes. Wash your windshield regularly, when you fill up with gas or at home. 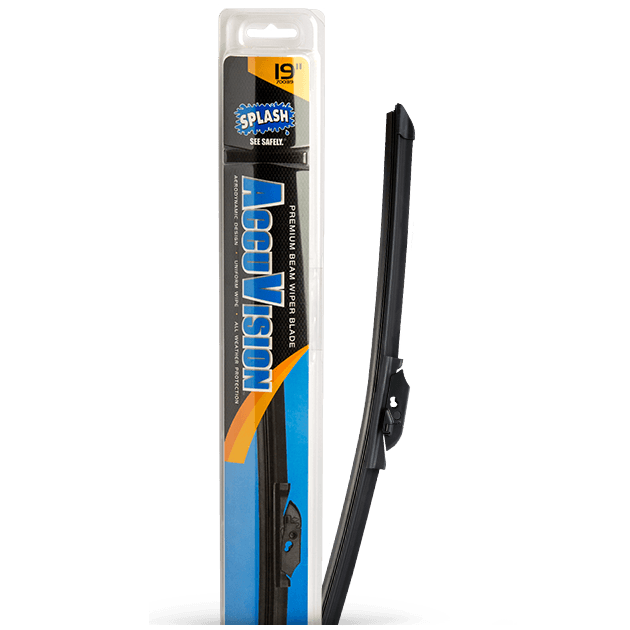 That way, your wiper blades won’t have to scrape over any residue that is stuck on your windshield and requires scrubbing. Scrape your windshield before running the wipers, as frost and ice can rip the rubber on your blades. 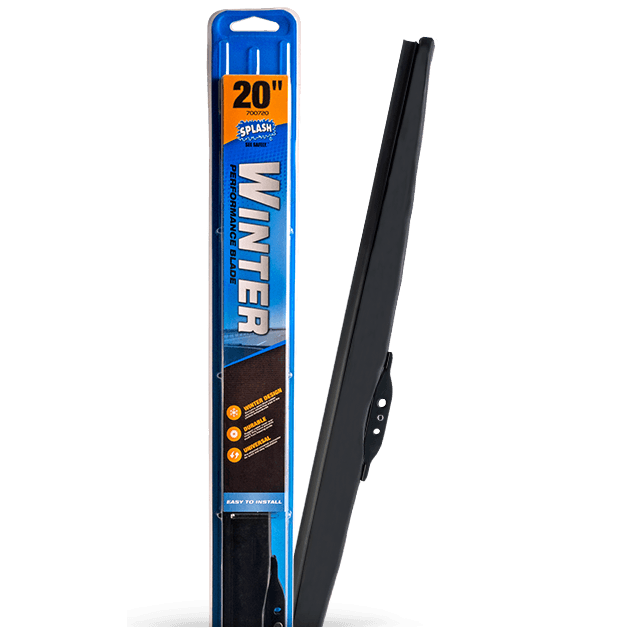 Clear your wiper blades of ice and snow with our Red Hot De-Icer before you use them. 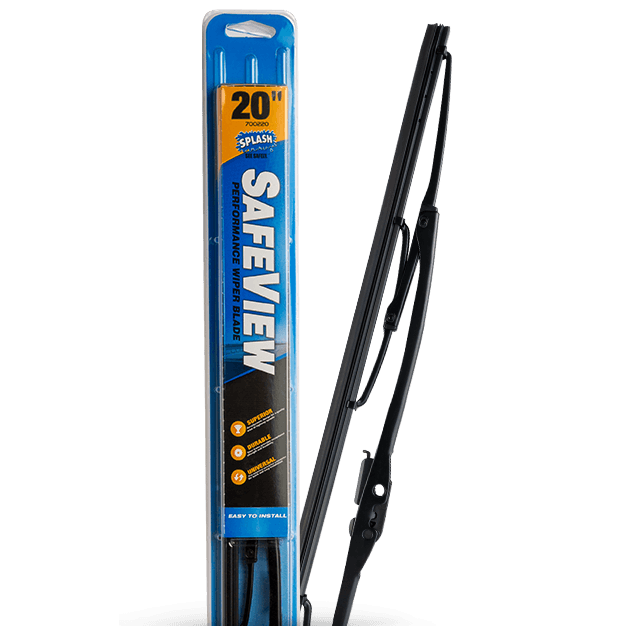 HOW DO I INSTALL ACCUVISION WIPER BLADES? 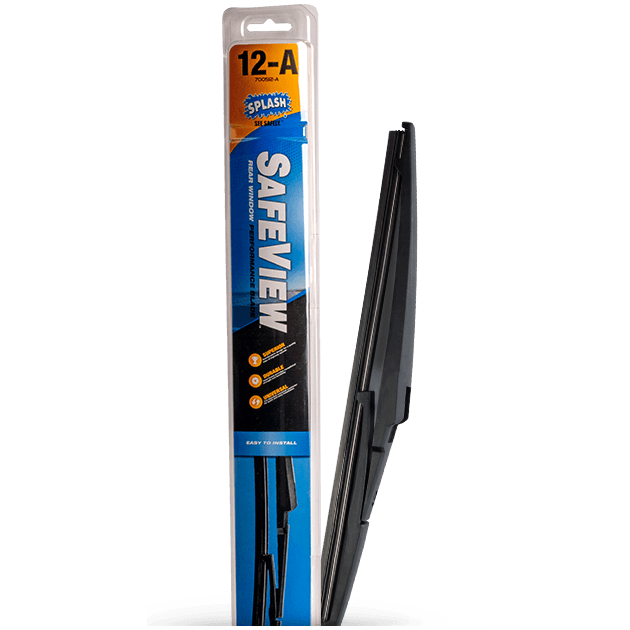 HOW DO I INSTALL SAFEVIEW PERFORMANCE WIPER BLADES?